Even if it didn’t mean to, WIPO should pat itself on the back for its handling of Legal Rights Objections. 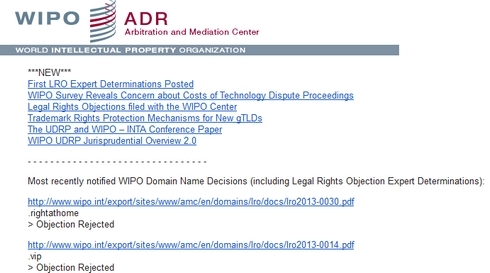 World Intellectual Property Organization (WIPO) has issued a lengthy report (pdf) detailing the process and results from managing Legal Rights Objections to new top level domain names. Although the report is merely an analysis, it appears WIPO is quietly patting itself on the back for a job well done. While the two other arbitration groups are still finalizing their cases, WIPO has already released a post mortem. The report details that cases cost less than anticipated. Decisions were made in a timely manner, too. They were mostly consistent. Compare that to The International Centre for Dispute Resolution and The International Center of Expertise of the International Chamber of Commerce, the groups handling string confusion, community, and limited public interest objections. They were often over budget, untimely, and inconsistent. The ICDR published the wrong draft reports, and published decisions in a poorly designed format. ICC is over budget, inconsistent, and fairly tardy. To be fair, the guidebook was written poorly for some types of cases. And not all types of cases are created equal. But that doesn’t excuse a lot of the inconsistencies and poor case management. If there’s one thing most new TLD observers will say about the objection process, it’s that WIPO comes out of it looking pretty darn good. Weak cases leading to failed Legal Rights Objections. With objectors losing the first 25 decided Legal Rights Objections (LRO) to new top level domains, there are murmurs about whether or not LRO is working. The LRO was created to assuage fears that someone would cybersquat on a top level domain. Groups like Association for National Advertisers scared their constituents into thinking someone might apply for their well known brand. For example, despite the $185,000 application fee, somebody other than Google would apply for .google to try to take advantage of the search giant. That didn’t happen. Yet 69 objections were filed. A quick look at the list explains why. Objections were filed against .VIP, .mail, and .home. Now, you tell me: when you hear these terms, what brand do you think is being cybersquatted? We’ll see a lot more of this with community objections, where people claiming to represent the gold community, the ski community, and the hotels community filed objections. You can see a full list of the 263 filed objections here.